The 2014/15 ALL-NEW Committee membership includes Beth Adelman, Christine Ciambella, Whitney Curtis, Patricia Dickerson, Susan Lewis, Taryn Rucinski, Loren Turner, and Stephanie Ziegler. The ALL-NEW Committee is planning the ALL- NEW Roundtable event, which is scheduled for Sunday July 19, from 11:30 a.m. to 12:45 p.m. in Room PCC 203A. The theme of this roundtable is networking. The roundtable event will have two formats. The first half will include three speakers. They will discuss how networking impacted their careers. The second half of the event will include an opportunity to network with attendees and members of the committee. The Committee is preparing a flyer to advertise the event. It will be distributed during CONELL Marketplace. In addition, the Committee is creating a networking toolkit that will be distributed to Roundtable attendees. The ALL-SIS Awards Committee is pleased to have selected the annual award and grant winners listed below. The ALL-SIS Outstanding Article Award: James M. Donovan, Carol A. Watson & Caroline Osborne, The Open Access Advantage for American Law Reviews, Edison 2015- 03A, http://www.jptos.org/news/375/100.html. The ALL-SIS Outstanding Service Award: Merle J. Slyhoff, Collection Development Librarian, University of Pennsylvania Law School, Biddle Law Library. Frederick Charles Hicks Award for Outstanding Contributions to Academic Law Librarianship: Blair S. Kauffman, Law Library Director and Professor of Law, Yale Law School, Lillian Goldman Law Library. Active Member Stimulus Grant: Susan David deMaine, Research & Instruction Librarian, Indiana University, Robert H. McKinney School of Law, Ruth Lilly Law Library & I-Wei Wang, Reference Librarian, University of California Law School, Boalt Hall Library. Regular Member Stimulus Grant: Karen Selden, Metadata Services Librarian, University of Colorado Law School. We are looking forward to honoring this distinguished group in Philadelphia at the ALL-SIS Awards Ceremony and Reception. The event will take place from 6:30 to 8:30 p.m. on Sunday, July 19th in the Marriott Grand Ballroom Salon E.
This past winter ALL-SIS was also able to award two grants for members to attend the Management Institute in March. The recipients are Brendan E. Starkey, Associate Director for Library Services at Chapman University Fowler School of Law and Ellen Frentzen, Assistant Librarian for Administration at Boston University’s Fineman & Pappas Law Libraries. The 2014-2015 committee members are: Kathleen Darvil (chair); Carol Bredemeyer; Joyce Manna Janto; Tawnya Plumb; Nancy Strohmeyer; and Michael Whiteman. Additional information on ALL-SIS awards and grants, including past recipients, can be found at http://www.aallnet.org/sections/all/awards. The program, The Bluebook, Five Years and an Edition Later: Connecting Librarians and Editors, was approved by the 2015 AALL Program Committee, and will be held on Tuesday, July 21, from 2:30 to 3:30 p.m., in Room PCC 103A. It will pair editors and law librarians in an open exchange of issues and changes to the new edition. Bluebook editors were contacted and all supported the relationship. A preliminary Community Page was created and will be populated as we move forward. Next year the Committee will focus on the clearinghouse aspect of the Committee while establishing procedures for communicating between our members and the editors. Members of the Committee include Merle Slyhoff, Chair, University of Pennsylvania; Deborah Heller, Columbia; Kumar Jayasuriya, Ober, Kaler, Grimes & Shriver; Dennis Kim-Prieto, Rutgers; John Nann, Yale; and George Taoultside, Harvard. The ALL-SIS CALI Committee held a meeting at the AALL Annual Meeting in San Antonio. The main topic of discussion was on where the committee should focus its energies, as the original purpose of the CALI committee has been subsumed by a CALI advisory committee with a longer timespan. This advisory committee reviews, updates, and critiques CALI legal research lessons and works best with members who have served and have longer experience working with the CALI lessons. The ALL-SIS CALI Committee is fortunate to have Sarah Glassmeyer, CALI’s Director of Community Development and a former academic law librarian, serving as CALI’s liaison to the committee. A number of interesting ideas were presented for the committee’s focus going forward. Promoting CALI Author as a useful pedagogical tool for law librarians who teach legal research. Not everyone is aware that CALI Author is a powerful piece of software that can be used to create online, interactive lessons for law students and other learners. CALI Author allows users to create a variety of different sorts of questions that can help students learn, including multiple choice questions, true-false questions, pairing and ranking questions, and even essay questions. CALI Author also allows authors to provide explanatory feedback that helps students understand sometimes subtle differences between right and wrong answers. An offshoot of this idea is to promote the use of available CALI lessons, that have gone through an exhaustive review process, and tailoring them to fit specific classroom situations. CALI allows faculty to edit lessons that already exist, so long as they get CALI’s approval. This can potentially make for an easier way to incorporate CALI’s interactive lessons into a legal research class with having to start from scratch to create lessons. Another idea was to possibly look at ways that academic law librarians might make use of CALI’s A2J software, that CALI has developed and distributes with help from the Center for Access to Justice & Technology (CAJT). A2J Author can be downloaded by faculty and law librarians at CALI-member law schools. It is currently used mainly by clinics and legal aid attorneys to create computer-based, self-guided A2J interviews for use by unrepresented litigants and others in need. A2J interviews walk users through a step-by-step question-and-answer process that helps to make sense of confusing legal procedures and create a usable legal form. A2J Author has been used and demonstrated by a number of law school clinic projects, and the ALL-SIS CALI Committee sees potential expanded uses for this software. As an example, librarians who teach legal research might be able to use A2J to develop research pathfinders, walking students through the process of asking research questions and guiding them to the various resources that can be used to answer these questions most efficiently. Other uses for this sort of step-by-step process might also be considered. One ambitious idea that the committee also came up with is starting an academic journal geared towards law librarians who are especially interested in technology and its uses for both legal research and legal education. The focus of such a journal would be on computer software, programming, educational technologies, and other technologies that are being developed and used by technologically-inclined law librarians in law schools throughout the country. Again, this is an ambitious idea and more of a long- term project that has the potential to serve the needs of the geekier edge of academic law librarianship in the future. These and a number of other ideas are under development by the ALL-SIS CALI Committee. We continue to discuss and develop these ideas and expect them to result in a long-term strategic plan as the committee moves forward. The Collection Development Committee has been communicating about the continuation of various projects taken on in 2013. Collection Development Toolkit, 2013-15: Much like the useful toolkits established by many other ALL-SIS committees, the Committee has decided to create a toolkit for those interested in collection development. This year, we moved forward with the toolkit, and have gathered articles focused on topics related to collection development. Those gathering readings have provided annotations, and we are creating an annotated bibliography before moving on to other portions of the toolkit. If you have a topic you’d like to see included or would like to draft a portion of the toolkit, please contact the Committee’s chair, Theo Belniak, tbelniak@buffalo.edu. Your expertise and opinions are welcome. Collection Development Policies on File with the Committee, 2013-15: After last year’s work of attempting to contact all of the ABA-accredited law schools to update the collection of policies gathered on the Committee’s webpage, we have now updated all the policies that we were sent by institutions, http://www.aallnet.org/ sections/all/storage/committees/colldev/cdpolicies-protected.aspx. ALL-SIS’s webmaster, Creighton Miller, was invaluable in this process. For those that have replied to our call for your collection development policy, thank you! This compilation is a useful community resource, and couldn’t exist without you. If your institution has updated its collection development policy recently, please feel free to forward the link to your policy or a PDF to your policy to the Committee’s chair, Theo Belniak, tbelniak@buffalo.edu. Resources and Links, 2013-2015: The Committee is working on revising its AALLnet.org pages in order to update available resources, links and contact information in 2014-2015. Please let us know if you would like to add a resource for your colleagues to this page. 2015 Annual Roundtable Discussion: As in past years, the Committee will be hosting a roundtable. This year’s roundtable slot is: Monday, July 20, 2015 at 3:15-4:30p.m., location: Marriott-Grand Ballroom Salon E. The conversation is always interesting and inspiring, and it is a good peek into how others are thinking about and working with collections. We hope to see you there! The 2014-2015 ALL- SIS Faculty Services Committee includes Valerie Aggerbeck, Pam Brannon, Lance Burke, Maureen Cahill, Cassie DuBay, Brittany Persson, Charles Pipins, Timothy Von Dulm and Candle Wester; and is co-chaired by Morgan Stoddard and I-Wei Wang. The committee focused on two major tasks: (1) reviewing, revising, and updating the Faculty Services Toolkit (last revised by the 2010-2011 committee), and (2) planning the 2015 Annual Meeting’s Faculty Services Roundtable. In reviewing the ALL-SIS Faculty Services Toolkit to assess whether revision was needed, the committee identified a number of suggestions for improvements and updates. In the four years since the 2011 Toolkit was published, there have been some changes in library services and the tools used to manage, administer, and market faculty services, as well as website redesigns and other innovations at many of the institutions used as examples in the Toolkit. Thus, a new and updated Toolkit seems timely and relevant. In order to provide current information and best practices, the committee decided to start by canvasing the libraries at all of the 180 ABA-accredited law schools in the United States individually, gathering information both via the libraries’ websites and personal contact with their librarians; in addition, the committee has solicited and received Toolkit contributions via the ALL-SIS Member Community, and has at its disposal information from the 2013 Faculty Services Survey results and recent job postings. It is hoped this comprehensive effort will build on and expand the efforts of the 2010-2011 committee. Once complete, the new Toolkit (along with an archived copy of the 2011 Toolkit) will be available at the ALL-SIS website (http://www.aallnet.org/sections/all/storage/committees/faculty/toolkit) (login required). What tips do librarians have for teaching and managing student research assistants in the library? How do libraries provide training and research support to faculty members’ research assistants? Have you hired a research assistant of your own to assist with any library projects for faculty? Are there other ways that libraries involve students in the provision of faculty services? How can librarians be more proactive in promoting library services or initiating contact? Tips for building stronger relationships with faculty and particular hurdles for library liaisons. How do you seek input or suggestions from faculty about current services or desired/future services? How does your library communicate major news or library updates? How do you get faculty inside the library? Does this matter to you or just that they utilize library services? How do libraries support faculty performing empirical research, particularly if you don’t have the resources to hire a dedicated empirical specialist? To what extent do you support faculty empirical research? For example, do you locate data sets, help them run statistical software, or have GRAs code data? Have you or your law school sought out partnerships with other departments, librarians or faculty on your campus to provide empirical research support? How have you (or other librarians at your school) educated yourself on conducting/supporting empirical research? The 2015 Faculty Services Roundtable will be held on Sunday, July 19th, from 11:30 a.m. to 12:45 p.m. in the Philadelphia Convention Center, Room 203B. We look forward to a lively and engaging discussion of these topics. The ALL-SIS Legal Research & Sourcebook Committee has nearly completed the long-term project of updating and revising the Sourcebook and its policies. In response to some feedback from AALL members, we have reevaluated our current attribution policy, submission guidelines, and review policy. The committee, in designated working groups, developed these new standards to help broaden solicitation material formats, keep Sourcebook content fresh, and use a new contributor-directed permissions policy to increase submissions. Finalizing the language and approving these policies will be the first step of the new committee for the 2015-2016 term. Currently the Legal Research & Sourcebook Committee is getting ready to host our roundtable discussions in Philadelphia. We hope many of you will join us to discuss current trends in assessment, legal research instruction, and the new ABA standards. The 2014-2015 Marketing & Outreach Committee members include: Margaret Jane Ambrose, Karin Johnsrud, Heather Joy, T.J. Striepe, Dana Rubin, and the committee outgoing chair is Shira Megerman. The committee focused this year on updating the toolkit from 2013 (found at: http://www.aallnet.org/sections/all/storage/Marketing-Outreach-Toolkit-2013) by soliciting and collecting materials on AALLNET in the different categories of the toolkit. We then provided the materials to Creighton Miller (as webmaster) to update the toolkit. Creighton and I are still working to better organize the information in a way that makes the toolkit more user-friendly. Look for the updated toolkit in the near future! The committee also held a roundtable at the annual meeting that was well attended. This year, the tables were themed based on the toolkit. Therefore, the topics were: Branding and Identity; Marketing and Outreach Plans; Marketing Tools and Examples; Social Media; and, Usability and User Studies. I was unable to attend due to a death in the family, and Karin Johnsrud, with very little notice, stepped up and ran the entire meeting (a very big thank you to Karin for all her continued support throughout the past two years on this committee). The notes from this meeting can be found on the committee website. This is only the second year for this committee, and as it grows, I expect new and exciting ideas will come from the wonderful leadership to follow. The Membership Committee is charged with maintaining a “Welcome Kit” and sending this information to new members of ALL-SIS. The committee revised the Welcome Kit and sent it to new members, who were identified with the assistance of ALL-SIS Secretary-Treasurer, Susan David DeMaine. The Committee prepared and submitted two new member profiles to the ALL-SIS Newsletter. Committee member Anupama Pal wrote a profile of Jonathan Roundtree, who is a reference librarian at the University of North Carolina at Chapel Hill. This profile appeared in the Winter 2015 issue of the Newsletter. Committee member Janeen Williams wrote a new member profile of Michaella Levandoski. Michaella is graduating from North Carolina Central University with a JD/MLS dual degree and is currently working as a reference assistant at the Law Library. The profile appears in the Summer 2015 issue of the ALL-SIS Newsletter. Committee members included Deborah Heller, Wendy Law, Minerva Mims, Anupama Pal, and Janeen Williams. The 2014-2015 Newsletter Advisory Board consisted of I-Wei Wang (Chair), Yasmin Sokkar Harker, Marlene Harmon, Ben Keele, Jocelyn Kennedy, Ruth Levor, Nina Scholtz and Thomas Sneed. Jocelyn was also our Board Liaison. The three regular issues this year were published on September 15, 2014, January 5, 2015 and June 15, 2015; the Election special issue was published on March 11, 2015. 20 regular (or semi-regular) feature columns by Advisory Board members, including the Law Librarian in the Dark DVD review series by Yasmin; Ruth’s Great Ideas from the Halls of Academe, featuring innovative and successful law library initiatives from around the ALL-SIS world; a PLL-SIS collaboration, The Collaborative Law Librarian spearheaded by Thomas; Asked & Answered, my semi-regular compilation of survey responses (formerly known as Survey Roundup); and new column Law Libraries as Publishers, by Ben. Marlene and Nina continued to pull together your Member News section and Jocelyn coordinated the Committee Spotlight, together giving ALL-SIS members and committees a chance to highlight their activities and accomplishments. 14 program reviews covering program sessions from the 2014 Annual Meeting and Conference in San Antonio. These included 12 contributions by non-Advisory Board member reviewers. Candidate statements for the 4 section members running for 2 positions in the 2015 election for ALL- SIS Executive Board. 14 annual committee reports for ALL-SIS committees. In memoriam articles commemorating the lives and achievements of past ALL-SIS members Nancy P. Johnson (Winter 2015) and Paul Lomio (Summer 2015) who passed away during the year. Both the Advisory Board authors and our outside contributors have continued to build on the strong visual presentation of our Newsletter articles, providing images and graphical elements that both enrich the content and enhance the visual appeal of the publication, while also reflecting the creativity and dynamism of our authors and readership. In our first year under new editorship, aside from modifying the layout and design of the Newsletter, we have focused on adjusting Advisory Board workflows and publication schedules. With this volume 34 of the Newsletter, we modified the issue schedule so that the Winter issue (which in the past was put together in January and typically published in mid-February) was completed before the holidays and posted at the beginning of the year. This schedule worked well and will be continued for future volumes. A plan for the future is to introduce an additional regular issue in the Spring (coming out around the same time as the special Election issue, which is limited to presenting candidate information for the ALL-SIS elections), making the Newsletter a true quarterly publication. Based on the number of unsolicited contributions received, it is hoped this schedule will produce timely and engaging content. Archived copies of the Newsletter continue to be collected online both on the ALL-SIS website (http://www.aallnet.org/sections/all/resources/newsletter/archives) and as part of Spinelli’s Law Library Reference Shelf on HeinOnline (where all issues since the inception of the Newsletter, with the exception of Volume 1, and Volume 2, Issue 1, are available). Finally, thanks go to Jocelyn and the ALL-SIS Board for support and guidance during the 2014-2015 year. The 2014-2015 ALL-SIS Nominations Committee was comprised of three members: Irene Crisci (Chair), Kristina Alayan, and Wendy Law. The Committee started its work in February, issuing a call for nominees and volunteers for the positions of Vice-Chair/Chair-Elect and Secretary-Treasurer. After the call for nominations was sent to the ALL- SIS membership the next step was to choose the candidates for this year’s election. Criteria normally considered when selecting candidates include geographic diversity, previous work for ALL-SIS and AALL, length of ALL-SIS membership and anything demonstrating the ability to responsibly serve as an officer. The Committee received numerous nominations for each position. The collection of nominees was as geographically diverse as possible with no adjustments from the Committee. All nominees were highly qualified. At the same time all of the nominees had demonstrated a commitment to serving AALL and ALL-SIS. As a result, weeding nominees was fairly difficult. The Committee chose two names for each office to forward to the Secretary/Treasurer for the election. Nonetheless, the nominations process went very well and we were fortunate to have a uniformly well- qualified list of nominees. As Chair I would like to take this opportunity to thank my Committee for their hard work and, above all else, responsiveness. Their willingness and enthusiasm for serving made my job both easy and pleasurable. The 2014-15 ALL-SIS Programs Committee (consisting of Jodi Collova, Michele Knapp, Kelly Leong, Katie Miller, Merle Slyhoff and Carissa Vogel) had a very productive year. As detailed in our Committee Spotlight report in the Fall issue of the ALL-SIS Newsletter, the Programs Committee again maintained a Speaker’s Database for ALL-SIS members to help connect program developers with potential speakers, and we also had an incredibly successful Program Submission Review initiative—we received program drafts from 11 ALL-SIS members, and each draft was reviewed and commented on by two Programs Committee members. This all took place in a very small window of time in late September, and Committee members rose to the challenge to review and return these to the members before the program submission deadline in early October. We hope that ALL-SIS members found this service useful and constructive. Simultaneously, a subcommittee met to discuss the independently sponsored SIS program. Based on the results of the ALL-SIS interest survey conducted last summer, we identified some key areas of interest for ALL-SIS members. Considering the theme of this year’s conference was “The Power of Connection,” and given that many ALL-SIS members indicated an interest in collaboration, we decided to curate a program based on collaboration in academic law libraries. Members of the subcommittee suggested potential speakers and we decided that Brian Mathews, Associate Dean of the Virginia Tech University Libraries and author of the blog The Ubiquitous Librarian, would be a good fit. Please take a minute to read Michele’s article on Dean Mathews in the ALL-SIS Newsletter, and we look forward to welcoming all ALL-SIS members to this program on Sunday, July 19, at 2:30 p.m. The Programs Committee requires a great deal of work in an already busy time period for academic librarians, and I am very much indebted to the hard work and dedication of Jodi, Michele, Kelly, Katie, Merle and Carissa for the meetings, projects and communication they participated in over the past year. Significant thanks are also owed to our Committee board liaison, Cindy Guyer, and the entire ALL-SIS Executive Board, for helping us arrange the sponsored program; further thanks to our AMPC liaison, Elizabeth Outler, for her help and guidance during the program proposal process. We look forward to seeing you all in Philadelphia this summer! The 2014-2015 ALL-SIS Research and Scholarship Committee consists of the following members: Amy Taylor, Heather Simmons, Dennis Kim-Prieto, Hadas Livnat, Ashley Krenelka Chase, Mary Ann Neary, Brian Anderson, Donna Spears, Bonnie Shucha, Shawn Friend, Xin (Sherry) Chin, and Carla Wale, ex officio. The committee met in San Antonio and also held a conference call in the beginning of the academic year. The committee modeled the application process after the AALL Research Grant with the following provision: The maximum amount of grant money available is $2,000. This $2,000 amount will be dispersed among the recipient(s) at the discretion of the review committee. Each grant awarded will be for a minimum of $250. Applications are considered under a blind review process, and our recommendations are submitted to the ALL-SIS Executive Board. The Executive Board will either approve the subcommittee recommendations, decline to make awards, or return the applications to the subcommittee for the further consideration. Applications were due on February 6, 2015. We awarded one grant to Jason Zarin for A Comparision of Case Law Results Between Bloomberg Law’s Automated Annotated Statutes and Traditional Human-Curated Annotated Codes. Continue with the mentor/mentee programThe mentor/mentee project continued to match mentors and mentees. The committee also began implementation of an overhaul of the mentor/mentee process, which will make the process much more streamlined and useful in the coming year. Lastly, the committee began using the My Communities feature of AALLnet to store documents and keep an institutional record of our committee. The 2014 -2015 Statistics Committee consisted of Alexandra Lee Delgado, Chair, Cracchiolo Law Library, University of Arizona James E. Rogers College of Law; Susan Azyndar, Moritz Law Library, The Ohio State University Moritz College of Law; Lisa Goodman, Paul M. Hebert Law Center, Louisiana State University Law Center; Lisa Junghahn, UC Irvine Law Library; Chuck Marcus, UC Hastings Law Library; Beth Mobley, Gould Law Library, Touro Law Center. Our Board Liaison was Lauren M. Collins. Lisa Goodman and Beth Mobley are the only members whose terms continue into the next year. The Statistics group did not have an active year. The group received an inquiry from the ALL-SIS Task Force on Legal Skills and Knowledge for Practice needs some help with qualitative data from its surveys. A committee member responded to this request; however, ultimately the committee was not involved in the analysis. Solicit ALL-SIS member input on problems found with ABA, ARL, and questionnaires. Work on proposing understandable definitions for statistics questions on ABA and ARL questionnaires. Work with the liaison to the Committee on Law Libraries of the ABA Section on Legal Education and Admission to the Bar to report concerns about questionnaires. Investigate how online reference transactions and any other quantitative information is gathered and reported. Other projects the Committee or the ALL-SIS Executive Board has identified as necessary. Submit one column to the ALL-SIS Newsletter describing the work of the committee during the current year. Although the committee does not deem it necessary to recommend changes to its purpose or term, members believe that the committee’s name may imply to others that the committee provides empirical support. We suggest information about the committee’s charge be supplemented with more information about past accomplishments and activities as examples. Work on proposing understandable definitions for statistics questions on ABA and ARL questionnaires as demonstrated by our FAQs and supplemental instructions for the annual questionnaires. Investigate through statistical surveys how online reference transactions and any other quantitative information is gathered and reported. One action item would be to help in AALL webinars. One suggestion is a training that will help librarians feel more confident advising faculty and lawyers in finding data. The second action item involves reference statistics. This item emerged from activities of members in their own institutions. There seems to be a great difference among libraries and librarians on categorizing transactions, particularly complex ones. The suggestion for the next committee is to perhaps investigate how online reference transactions and any other quantitative information is gathered and reported. The Strategic Planning has begun a review of the 2013-2016 Strategic Plan, comparing it to the current AALL Strategic Directions to look for any discrepancies or omissions, as well as any items in need of revision or deletion. We also sent a query to the ALL-SIS Executive Board to find out what the board would like to see in the next version of the Strategic Plan. In the upcoming year we will work to solicit the input of the ALL-SIS membership through various means, including online surveys, blog posts, and possible attendance at regional chapter meetings. We also hosted a “Question a Day” on the AALL My Communities e-mail for a week in February, asking Student Services librarians to offer guidance and insight on certain aspects of Student Services in their libraries. The questions and responses are posted on our website as ALL-SIS Student Services “Question a Day” (February 9-13, 2015). The 2013-2014 ALL-NEW Committee is chaired by Shawn Friend. Members include: Beth Adelman, Christine Ciambella, Whitney Curtis, Patricia Dickerson, Sara Gras, Loren Turner, and Stephanie Ziegler. The ALL-NEW committee is striving to build off of the success of last year’s roundtable event in Seattle by planning another informative roundtable and also working to create new programs and resources for new members to the profession. These projects are ongoing and are expected to help build more support for new librarians as they enter into the profession. Outside of the roundtable, the committee is working on two main projects. The first project is creating a “cheat sheet” for new librarians that will include quick information about ‘go to’ resources members have found useful for answering questions. The committee hopes to post the cheat sheet online once it is complete. The committee’s second project is developing a tool kit for new librarians. This kit will provide new librarians with contact information of committee members so new librarians can begin building their network, the cheat sheet, and a round-up of tips and information gained from this year’s roundtable. The planned roundtable for this year is building upon the success of last year. Topics for this year are still being decided, but the committee hopes to include topics new librarians might be afraid to ask questions about and also topics that will help them build a solid foundation as they begin their career. ALL-NEW is also working with Gen X / Gen Y to assist new law librarians with building their support structure and promote the activities of each SIS. ALL-NEW is also hoping to work with any new librarians who are interested in having a conference buddy during their first conference. ALL-NEW is excited about the projects we have started and is looking forward to the future. And remember, if you see a new librarian wandering around, especially in San Antonio, welcome them to the profession and give them a heads up on the best social events to attend! The ALL-SIS Awards Committee recognizes deserving librarians with Awards and Grants, and was very active this year. The 2013–2014 ALL-SIS Awards committee consisted of Irene Crisci, Touro Law Center; Kathleen Darvil, Brooklyn Law School; Joyce Janto, University of Richmond, School of Law; Cathy Wagar, Loyola University New Orleans; Michael Whiteman, N.K.U. Chase College of Law; Annmarie Zell, N.Y.U. Law School. AALL Leadership Academy: Patrick Butler, University of Connecticut, School of Law. 2013 ALL-SIS Outstanding Article Award: Cindy Guyer, University of Southern California, Gould School of Law. RECOGNITION OF WINNERS: These grant and award winners will be recognized at the ALL-SIS Reception and Awards Ceremony to be held on Sunday, July 13, 2014, 6:30 p.m. – 8:30 p.m. at the Sarita Kenedy East Law Library, St. Mary’s University School of Law, during the 2014 AALL meeting. In July 2013 the SIS membership voted to adopt revised ALL-SIS Bylaws that conformed to the AALL Model Bylaws and current SIS practices and also defined some new practices. The 2013-14 Bylaws Committee suggested that one new article be considered for addition to the bylaws. The proposed bylaw, “Antidiscrimination,” conforms to the AALL Bylaw adopted in February 2014. If approved by the Executive Board and adopted by ALL-SIS, its inclusion as Article III would necessitate the renumbering of existing Articles III through IX to become Articles IV through X. Members of the 2013-14 Bylaws Committee were Emily Lawson, Ronald Wheeler, Sue Kelleher, and Lynn Wishart, chair. This year was the first year for the reconfigured CALI committee. The committee’s charge was to work with CALI to develop new instructional tools. To that end, the committee met at the 2013 Annual meeting and brainstormed ideas for the coming year. We decided to focus on developing ways to promote CALI, coming up with new ideas for using CALI resources, supporting our members’ attendance at the CALI conference, and brainstorming new tools and lessons. During the meeting, we identified technology basics, document preparation, and courtroom technology as potential new CALI lessons. The committee proposed, and the ALL-SIS board approved, a CALI travel grant to be adminis-tered by the awards committee. The committee also issued a Call for Ideas to Promote CALI tools and resources. These materials can still be submitted to the committee. Members included Ashley Ahlbrand, Lorell Anderson, Kevin Baggett, Iain Barksdale, Shannon Kemen, Susanna Leers, Alex Berrio Matamoros, and Michael Roffer. Four moderated e-forum discussions via the MyCommunities platform in 2013-2014. Updating the ALL-SIS Collection Develop-ment Committee’s collection development policy page. Updating the resources and links listed on the ALL-SIS Collection Development page. Planning the roundtable for this year’s annual conference. E-books and consortial agreements, October 21-23, 2013, moderated by Susan Gualtier, Maureen Garmon, and Kevin Carey. Patron-driven acquisitions, December 9-11, 2013, moderated by Rebecca Mattson and Diana Jaque. Changing ABA standards, February 10-12, 2014, moderated by Jane Woldow, Patricia Fox, and Theo Belniak. Collection development in different institu-tions, April 14-16, 2014, moderated by Helen Wohl, Michelle Cosby, and Theo Belniak. Although the Committee established a special community in MyCommunities, “ALL-SIS Collection Development E-Forums,” for the discussions and 120 members signed up for the community, the conversations were less lively than the Committee expected. The Committee plans to deploy a short survey to the special community’s members to define barriers to participation and potential topics for future forums. Much like the useful toolkits established by many other ALL-SIS committees, the Committee has decided to create a toolkit for those interested in collection development. This year, we established a rough outline for the toolkit, and are currently gathering articles focused on topics related to collection development. If you have a topic you’d like to see included or would like to draft a portion of the toolkit, please contact the Committee’s chair, Theo Belniak, tbelniak@buffalo.edu. Your expertise and opinions are welcome. This year, Committee members have attempted to contact all of the ABA-accredited law schools to update the collection of policies gathered on the Committee’s webpage, http://www.aallnet.org/sections/all/storage/committees/colldev/cdpolicies-protected. The Committee chair is working with ALL-SIS’s excellent webmaster, Creighton Miller, to update the page with the new policies over the next few months. For those who have replied to our call for your collection development policy, thank you! This compilation is a useful community resource, and couldn’t exist without you. If your institution has updated its collection development policy recently, please feel free to forward the link to your policy or a PDF of your policy to the Committee’s chair, Theo Belniak, tbelniak@buffalo.edu. The Committee plans to revise its AALLnet.org pages in order to update available re-sources, links, and contact information in 2014-2015. Preliminary work in 2013-14 included a cursory review of the pages made available by the Committee. Discussion of next steps will occur after this year’s annual meeting. Monday, July 14, 2014 at 5:30pm, location TBA. The Committee had a conference call scheduled for May 29th to discuss the roundtable and other projects, so stay tuned for an announcement about the topics and format of the roundtable before the annual meeting. The conversation is always interesting and inspiring, and it is a good peek into how others are thinking about and working with collections. We hope to see you there! Committee Members: Theodora Belniak (chair), Kevin Carey, Michelle Cosby, Patricia Fox, Maureen Garmon, Susan Gualtier, Diana Jaque, Rebecca Mattson, Helen Wohl, and Jane Woldow. The 2013-2014 ALL-SIS Faculty Services Committee consists of the following members: Lance Burke, Maureen Cahill, Walt Cook, Katy Stein, Morgan Stoddard, Timothy Von Dulm, I-Wei Wang, and Candle Wester. Seth Quidachay-Swan and Christina Tsou are Co-Chairs of the committee. In the past year, the committee focused on three main projects: (1) improving the Faculty Services Committee website with recommended changes and updated information; (2) compiling and summarizing the responses to the 2013 Faculty Services Survey; and (3) preparing for the 2014 Annual Meeting’s Faculty Services Roundtable. The website project entailed reviewing the cur-rent ALL-SIS Faculty Services website to deter-mine which changes were appropriate. Not only was the formatting changed but outdated and ir-relevant information, such as old meeting minutes, was removed. All links to faculty services web-pages from various law schools were also up-dated. The new committee website is available at: http://www.aallnet.org/sections/all/committees/pages/faculty-svcs.html. The survey project involved reviewing the 75 responses from the 2013 Faculty Services Survey, categorizing the responses, and tabulating or otherwise presenting the data graphically. A summary report was produced and posted onto the new committee website. This survey was particularly useful and timely because it updated a previous 2005 survey and provided information about developing trends and the changing dynamics of faculty services in academic law libraries. Lastly, the committee planned for the upcoming Faculty Services Roundtable at the 2014 AALL Annual Meeting in San Antonio, Texas. This year, there will be three roundtable discussions: (1) the role of non-traditional faculty services and how to expand their use in libraries; (2) the divide between different generations of faculty members and how to best meet each group’s needs with new technologies; and (3) a look at innovative new approaches to providing faculty ser-vices. The Roundtable will be held on Monday, July 14, 2014 from 11:45 a.m. to 12:45 p.m. in HBGCC-Room 007D. We look forward to a lively discussion of these topics and the opportunity to learn from our colleagues. The Legal Research & Sourcebook Committee began its year with another successful roundtable at the AALL Annual Meeting in Seattle. This lunchtime session featured 10 tables, each discuss-ing various aspects of legal research instruction and training, including demonstrating multiple platforms during classroom time, creating complex research exercises, flipping the classroom, and teaching non-JD students. The roundtable also featured a chance to discuss the results of the ALL-SIS Task Force on Identifying Skills and Knowledge for Legal Practice’s report. The notes from this session are available on the committee’s webpage. The committee will be hosting this year’s roundtable at the San Antonio Annual Meeting as well. Come join us on Monday, July 14 from 11:45 a.m. – 12:45 p.m. in the Marriott Rivercenter-Salon K. More information about the roundtable will be distributed to ALL-SIS members closer to the Annual Meeting. Thanks to the time and efforts of Creighton Miller, the ALL-SIS webmaster, the Sourcebook for Teaching Legal Research was successfully migrated to the new AALLNET website platform this year. One significant change as a result of this migration is that the Sourcebook can now be accessed with an AALLNET login rather than a separate username and password, as required in the past. The committee also took a serious look at the current content in the Sourcebook, discussing ways to keep submissions as up-to-date and useful as possible. Due to ongoing development and changes to legal research platforms and materials, the Sourcebook must also continue to provide current materials to ALL-SIS members too. All current Sourcebook authors are invited to consider updating their existing materials; and new submissions are always welcome as well! Materials may be submitted at any time to the current committee chair. Committee Members: Deborah Schander (chair), Jane Bahnson, Jan Bissett, Catherine Deane, Michelle Hook Dewey, George Jackson, Karen Skinner, Marsha Stacey, Roberta Woods. Create a report and compile appropriate materials to assist academic law libraries in marketing their services to their patrons. If possible, compile a marketing toolkit with resources libraries can customize to their own needs. The Task Force will make all of their materials available online for ALL-SIS members. By December 1, 2012 deliver to the Executive Board a finalized report that will be made available to ALL-SIS members. Authors on the White Paper, toolkit, and members of the Task Force included Amanda Runyon, Chair (University of Michigan), Carol A. Watson (University of Georgia), Cindy Dabney (Indiana University–Bloomington), Liz McCurry Johnson (Wake Forest University), Emily Lawson (University of Houston), Shira Megerman (University of Florida), Jamie Sommer (Northwestern University), T.J. Striepe (University of Georgia), Michele Thomas (University of Arkansas—Little Rock). The Task Force completed and submitted a White Paper to Law Library Journal, and it was published in the Fall 2013 issue. Designed to accompany the White Paper, the toolkit expands on theories discussed in the White Paper and provides concrete examples for members. The information in the toolkit was collected in several different ways. General research was conducted on marketing and outreach for libraries, and a bibliography was compiled. Requests were made to different communities on AALLNET, and the Task Force was therefore able to collect actual items used by different libraries, such as job descriptions, annual reports, brochures, etc. The Task Force also hosted a roundtable discussion at the 2012 and 2013 annual conferences, and the committee plans on hosting one again this year. The discussion notes from those meetings can be added to the toolkit for members to discover what marketing and outreach techniques worked, and which failed at different libraries. Moving forward, it is projected the committee will do most of its work through the expansion of the toolkit. Upon recommendation of the Task Force upon its close in July 2013, the ALL-SIS Executive Board, transitioned the task force into a committee, and members were appointed. As this was the first year of the committee, the charge was to continue the work of the task force, and a new charge to be determined as the committee develops. Committee Members: Shira Megerman, Chair (University of Florida), Rob Beharriell (Nova Southeastern University), Cindy Dabney (Indiana University—Bloomington), Liz McCurry Johnson (Wake Forest University), Karin Johnsrud (Supreme Court Library), Thomas “TJ” Striepe (University of Georgia). Here is a rundown of the committee’s responsibilities completed this year. The basic charge of the ALL-SIS Membership Committee is listed at http://www.aallnet.org/sections/all/committees/charges#membership The Committee work includes sending the Welcome Kit (email) to each new member, and writing profile articles for the newsletter. We began our outreach to members when we received the ALL-SIS roster from Meg Butler, Secretary-Treasurer. Several of our committee members volunteered to send out the ALL-SIS welcome kits to new members and the other members divided up new-member articles, spotlighting members for the newsletters. The committee also brainstormed and submitted suggestions to the AALL Recruitment to Law Librarianship special interest section to help in their efforts to revamp and update the SIS website this year. The 2013 – 2014 Newsletter Committee consisted of Barbara Gellis Traub, Chair, Rittenberg Law Library, St. John‘s University School of Law; Marlene Harmon, University of California Berkeley Law Library; Jocelyn Kennedy, University of Connecticut Thomas J. Meskill Law Library; Ruth Levor, University of San Diego Legal Research Center; Taryn Rucinski, Pace University School of Law Library; Margaret Schilt, University of Chicago D’Angelo Law Library; Nina Scholtz, Cornell University Law Library; and Thomas Sneed, Emory University, Hugh F. MacMillan Law Library. Our Board Liaison was Leah Sandwell-Weiss. Our three regular issues this year were published on October 10, 2013, February 4, 2014, and approximately June 20, 2014; the election issue was published on March 10, 2014. At the suggestion of new committee member Ruth Levor, we inaugurated a new column, “Great Ideas from the Halls of Academe”, in which Ruth solicits and shares successeful (and not-so-successful) library innovations. Ideas shared included the University of San Diego’s Info Station, innovations in teaching legal research by the librarians at the University of San Francisco Zief Law Library, and the Excellence in Research program at Texas Tech. Committee members and 15 other ALL-SIS members wrote articles covering more than 25 programs and other activities at the 2013 Annual Meeting in Seattle (Fall issue). In addition the winners of the CONELL grants shared their experiences. Flipped Classrooms (Susan M. Boland, University of Cincinnati Law Library). Articles in the Spring/Summer issue include an “Chat Services in Academic Law Libraries” (Ingrid Mattson, Moritz Law Library, Ohio State University); “Leadership Academy 2014” (Patrick Butler, University of Connecticut School of Law); and “ALL-SIS Sourcebook for Teaching Legal Research (Karen Skinner, Univ. of Southern California Gould School of Law on behalf of the Sourcebook Committee). The Spring/Summer issue also includes ALL-SIS Committee Annual Reports, regular co-umns, and a preview of the Annual Meeting in San Antonio. Taryn reviewed “Igniting Faculty Services in Your Library” program from the 2013 Annual Meeting, and contributed an article about Administrative Agency Bluebook Citations to the Winter Issue. Margaret reviewed the AALL Leadership Training at the 2013 Annual Meeting. Ruth’s column appeared in all three issues, sharing many innovative ideas. Marlene and Nina revitalized our Member News column by soliciting lots of announce-ments for all three issues. Again this year, we had a good number of articles submitted by librarians who were not on the Newsletter Committee. I hope this trend continues in the future. Reviews of 2013 Annual Meeting programs were written by Deborah Schander, Susanna Leers, Kim Castellano, Benjamin Keele, I-Wei Wang, Jennifer Allison, Brendan Starkey, Jennifer Noga, Jackie Magagnosc, Anna Endter, Edward Hart, Marsha Stacey, Alicia Jones, and Shaun Jamison. Articles published in the Winter and Spring/Summer issues are highlighted above. A major housekeeping matter was the collection of all print copies of the Newletter in order for them to be posted to Spinelli’s Law Library Reference Shelf on HeinOnline. We were able to obtain all issues since the inception of the newsletter, with the exception of Volume 1, and Volume 2, Issue 1. According to Richard Spinelli from HeinOnline the collection will be released June 30, 2013. Thank you to all the authors, whether members of the committee or not. Your work and scholarship is greatly appreciated by colleagues, I am sure. Thanks also to Lauren, Leah, and the ALL-SIS Board for support and guidance during the 2013-2014 year. Finally, I want to especially thank Leah Sandwell-Weiss for her friendship and guidance over the last four years. I could not have done this without you! I now give up responsibility for the ALL-SIS Newsletter to our new Editor, I-Wei Wang. Best of Luck! The 2013-2014 ALL-SIS Nominations Committee was comprised of three members: Edward Hart (Chair), Jane Larrington, and Donna Nixon. The Committee started its work in December, issuing a call for nominees and volunteers for the positions of Vice-Chair/Chair-Elect and Secretary-Treasurer. After the call for nominations was sent to the ALL-SIS membership the next step was to choose the candidates for this year’s election. Criteria normally considered when selecting candidates include geographic diversity, previous work for ALL-SIS and AALL, length of ALL-SIS membership, and anything demonstrating the ability to responsibly serve as an officer. The ALL-SIS Public Relations committee met at the AALL annual meeting in Seattle, where we discussed our work for the coming year and divided tasks. One role of the committee is to solicit news from ALL-SIS officers and committees throughout the year and submit it to AALL Spectrum. One of our committee members emailed ALL-SIS officers throughout the year requesting information about awards, meetings, and other news; unfortunately, we received few responses to our inquiries. Second, the committee reviewed the ALL-SIS brochure to make sure it was up-to-date. Finally, the committee was in charge of selecting and ordering the items (and the sayings on the items) to be given away at AALL in San Antonio. We chose great ones this year so make sure to stop by the ALL-SIS table at the CONELL Marketplace and at the Annual Meeting Exhibit Hall. Additional information on the ALL-SIS Public Relations committee, including brochures, can be found on its website at http://www.aallnet.org/sections/all/committees/pages/public-relations.html. I would like to thank each of the committee members for their excellent work. The 2013–2014 ALL-SIS Public Relations committee included Esther Cho, Georgetown University; Adrienne DeWitt, North Carolina Central University; Julia Jaet, Marquette University; and Eric Young, Nova Southeastern University. During this year the Research and Scholarship Committee successfully implemented the Scholarly Writing Mentor Program, which is a scholarly writing network and support program for law librarians. At least 40 mentees were paired with mentors during the year for advice and consultation on their writing projects. The program is the work of the Scholarly Writing Mentor Program Sub-Committee (Carla Wale, Chair). Law librarians interested in participating as a mentee or mentor are encouraged to email LawLibariansMentor@gmail.com. Committee members organized and presented an informative AALL webinar entitled What’s in Your Toolbox? : Tools to Organize Your Research, Scholarship, or Professional Writing. The webinar was presented on May 22, 2014. The coordinator for the program was committee member Ellen Richardson. Committee Chair D.R. Jones was the moderator and committee members Carla Wale, Ben Keele and Jordan Jefferson were speakers. Also speaking in the webinar were Sherry Leyson and Tim Gallina. The webinar focused on tools to help librarians organize, write, edit and share their scholarship and professional writing. The Grant Program Sub-Committee (Ben Keele, Chair) is developing a research and scholarship grant program. The Research and Scholarship Committee maintains a wiki to provide information and resources for law librarians interested in scholarship. The wiki is available at http://lawlibrarianswrite.pbworks.com/. Joe Mitzenmacher and Erin Schlicht re-vamped the Student Services web page by organizing and adding content, including materials from past programs and roundtable discussions. Amy Ash, Stacy Etheredge, Rob Beharriell, Frances Brillantine, Margaret Krause and Jacob Sayward continued the work begun on this project by the 2012-2013 committee, compiling job de-scriptions, a student services bibliography, infor-mation on marketing, and information on services offered to students. The Toolkit was posted to the Student Services website in February. Jackie Woodside and Maureen Moran updated this resource by adding links to all defined student service pages for all ABA-accredited law libraries. They also edited and updated the user guide section of the page to include only user guides that are not directly linked from student services websites. The Student Services Roundtable at AALL will take place on Monday, July 14, at 5:30pm. Margaret Krause, Joe Mitzenmacher, Jacob Sayward and Rob Beharriell will moderate discussions on a variety of topics. Notes from the roundtable will be posted on the Students Services website after the meeting. Jackie Woodside (University of California, Irvine). The Task Force was charged with collecting data from various law schools about how they are responding to current trends affecting libraries such as shrinking student bodies, shrinking budgets, choice of format, and space concerns. The Task Force has identified several existing sources of information such as the ABA Take Offs, a survey conducted by TS-SIS in 2011-2012, and ARL survey data. In addition, the Task Force has directed a survey for academic law library directors and is currently seeking IRB approval to administer the survey. Members of the Task Force will host a roundtable at the San Antonio Annual Meeting to discuss findings thus far and seek input from attendees. The roundtable will be on Sunday, July 13, 2013, 5:30-6:30pm. I would like to thank each of the Task Force members for their work on this project. The 2013-2015 Task Force consisted of Kristina L. Niedringhaus, Georgia State University, Co-chair; Rhea Ballard-Thrower, Howard University, Co-chair; Barbara Bintliff, University of Texas; Ken Hirsh, University of Cincinnati; Eric Parker, Northwestern University; Phebe Poydras, Indiana Tech; David Zopfi-Jordan, University of Minnesota. The Task Force on Identifying Skills & Knowledge for Legal Practice is putting the finishing touches on its second report, comparing practitioner and librarian responses to the surveys we prepared on legal research practices and on the opinions of new associates’ research skills. The report will focus on the statistically significant differences in the responses made by practitioners and by librarians. An appendix will summarize the librarian responses, and both the practioner report and the full survey instruments from 2013 are available if you click on the task force name. The Task Force will continue its work on the qualitative analysis of our survey responses and will report those findings in 2015. The Task Force is also working on a survey on legal research offerings, both first year and advanced, and will have its report ready for 2015. 2013 ALL-SIS Outstanding Service Award — Creighton J. Miller, Jr. These grant and award winners will be recognized at the ALL-SIS Reception and Awards Ceremony to be held on Sunday, July 14, 2013, 6:30 p.m. – 8:30 p.m. at the University of Washington Law School, during the 2013 AALL meeting. I would like to thank each of the committee members for their excellent work. The 2012–2013 ALL-SIS Awards committee consisted of Jane Larrington, University of San Diego, Chair; Irene Crisci, Touro College; Lisa Goodman, Texas Wesleyan University; Matthew M. Morrison, Cornell University; Cathy Wagar, Loyola University (New Orleans); Annmarie Zell, New York University. The CALI Committee has been busy this year working in conjunction with Sarah Glassmeyer, Director of Content Development at CALI, to review lessons and recruit new authors. Since AALL 2012 ten new legal research CALI lessons have been reviewed by the Committee and 7 new lessons have been updated and republished under CALI’s Reviser Project. The CALI Reviser Project was started several years ago to provide updating for lessons that the original authors no longer wished to update. The Reviser Project is an excellent way to try out being a CALI author without committing to writing an entire lesson. More information about the CALI Reviser Project is available at http://www.cali.org/Revisers. You can sign up for an RSS feed to be updated when new CALI lessons are published or revised. Sign up and see a list of lessons at http://www.cali.org/lessons_new or http://www.cali.org/lessons_updates. CALI will once again be hosting a booth in the exhibit area at AALL in Seattle and CALI staff and authors will be available throughout the conference to speak with you about being an author, reviser, or using the lessons in your teaching. Stop by the booth to learn more about CALI lessons and other CALI projects such as Classcaster, eLangdell or InstaPoll. The ALL-SIS Collection Development Committee met at the annual meeting in Boston, where we discussed our work as selectors and acquisition librarians. One thing that flowed from our conversation is that one role of the Committee is to act as a support group for our collections work. To that end, this year, we communicated among ourselves as a friendly way to discuss collection policies, practices, trends and disasters – mostly on meta-plans for collecting within libraries. “Where Do We Begin? What the Proposed Revisions to ABA Standard 606 Will Mean for Your Collection – and Your Budget”? The coffee talk is open to all and will be held on Tuesday, July 16 at 7:30 in the convention center. Check here for the exact location: http://www.aallnet.org/conference/education/coffee-talks.html. In addition, there will be a Collection Development roundtable hour on Monday, July 15 at 5:30 pm. Check here for information on location: http://aall2013.crowdcompass.com/activities/7P0UHk5bso. The roundtable is an open forum and the conversation will be directed by those who come. Some potentially interesting areas of focus may be on what, if anything, libraries are doing with ebooks – including effect on budgets, cataloging, platforms, technologies, managing updates, and tracking user statistics. Another possible topic is how libraries are considering the stewardship of materials they no longer own. Potential projects for the coming year are: to create a list of cooperative and other collaborative collection programs; and update the committee’s website of materials, including collection development policies (http://www.aallnet.org/sis/allsis/committees/colldev/index.asp). The 2012-2013 ALL-SIS Faculty Services Committee members include: Maggie Adams, Walt Cook, Bill Ketchum, Lisa Peters, Katy Stein, Seth Quidachay-Swan, Christina Tsou, Stefanie Weigmann, and Clare Willis, and the committee is chaired by Jessica Wimer. The committee focused on three areas: (1) reviewing the Faculty Services Committee website and recommending changes and updates, (2) updating the 2005 Faculty Services Survey and distributing a new survey, and (3) planning the 2013 Annual Meeting’s Faculty Services Roundtable. The first task was reviewing the current ALL-SIS Faculty Services website to assess whether any changes should be made when the website moves to a new format. The committee identified a number of suggestions for improvements, but since the status of the ALL-SIS website migration is still being finalized, these suggestions will be passed along to next year’s committee for review. Second, the committee decided to update the 2005 Faculty Services Survey and distribute a new survey to the ALL-SIS community. Changes in technology have caused significant changes in library services in the past few years, making a new survey relevant and informative. After reviewing feedback provided in the original survey, the committee decided to shorten the survey in addition to updating the questions. The revised survey was distributed May 15, 2013, and within the first week the committee received 50 responses. Finally, the committee planned the Faculty Services Roundtable for the 2013 Annual Meeting. The following five topics will be discussed: (1) marketing library services to faculty, (2) instructing faculty on new ways to access traditional resources (e.g. WestlawNext, Lexis Advance, library catalogs using discovery platforms, etc. ), (3) roles librarians can/should play in assisting faculty with substantive course content, (4) emerging issues with distance learning (from working with faculty and LLM students, to training RAs who are off-sight), and (5) promoting faculty scholarship and online repositories. The 2013 Faculty Services Roundtable will be on Sunday, July 14th, at 12:30. We look forward to a good turnout and to discussing these topics. This year, the Membership Committee was re-created as a separate Committee. It was formerly combined with the ALL-NEW Committee. The Chairs for both the Membership and ALL-NEW Committees determined the best way to maintain a healthy relationship between the two Committees was to have each Chair serve as a member of the other Committee. This worked well and we recommend that this collaboration be continued in the future. The Membership Committee updated the “Welcome Kit” that is sent to each new member of our Special Interest Section. In the past, new members would be identified from the AALL E-Newsletter. The Committee worked with AALL Headquarters to determine a more thorough and timely method to identify new members to our Special Interest Section. New members can now be identified by an ALL-SIS Executive Board Member by searching the ALL-SIS roster maintained by AALL Headquarters. The Secretary-Treasurer, Meg Butler, ran the list approximately every month enabling the Committee to send the “Welcome Kit” in a timely manner. The instructions for running the roster search will be maintained and communicated to each incoming Chair of the Membership Committee. The Membership Committee is charged with spotlighting members in the ALL-SIS Newsletter. Formerly, as the Membership Committee was combined with the ALL-NEW Committee, the spotlight was always about a brand new member to the Special Interest Section. The Committee intends to expand the spotlight to include not only brand new members but also members that have been with the Special Interest Section a while. Two members of our Special Interest Section are spotlighted in this edition of the Newsletter. While two of our Committee members are now on sabbatical, the remaining members are working to create suggestions for a “New Members” section of the ALL-SIS Website that will include information from the “Welcome Kit,” the ALL-SIS brochure, and an invitation to contact any of the members of the Membership Committee with questions. Finally, while the Public Relations Committee is responsible for the Special Interest Section Table in the exhibit hall during the annual meeting, the members of the Membership Committee decided that attending members of our Committee should commit to help staff the Table as much as possible. The 2012 – 2013 Newsletter Committee consisted of Barbara Gellis Traub, Chair, Rittenberg Law Library, St. John‘s University School of Law; Yasmin Sokkar Harker, CUNY Law School Library; I-Wei Wang, U.C. Berkeley School of Law Library; Margaret Schilt, University of Chicago D’Angelo Law Library; Thomas Sneed, Emory University, Hugh F. MacMillan Law Library; Theodora Belniak, S.U.N.Y. Buffalo Charles B. Sears Law Library; Taryn Rucinski, Pace University School of Law Library; and Karen Schneiderman, University of Hawaii School of Law Library. Our Board Liaison was Leah Sandwell-Weiss. The three regular issues this year were published on October 11, 2012, March 6, 2013, and approximately June 27, 2013; the election issue was published on March 11, 2013. At the suggestion of committee member Thomas Sneed, we inaugurated a new column, “The Collaborative Law Librarian,” which Thomas has written and will continue to write. The column is to be shared with authors from the PLL-SIS as an exchange of information. Committee members and 7 other ALL-SIS members wrote articles covering more than 13 programs and other activities at the 2012 Annual Meeting in Boston (Fall issue). In addition to our regular columns, the Winter issue published 4 articles submitted by non-Committee members. These articles covered “Teaching Legal Research and Writing to International Students” (Ingrid Mattson, Ohio State Moritz Law Library); Researching the Financial Crisis (Gail Whittemore, Pace Law Library); video collections on demand (Terry McCormack, S.U.N.Y. Buffalo Law Library); and “A Caveat to the Past” (Christine George, S.U.N.Y. Buffalo Law Library). Articles in the Spring/Summer issue include an “Update on Proposed Revisions to ABA Standard 603” (Scott Pagel, George Washington Jacob Burns Law Library); the new ALL-SIS Scholarly Writing Mentor Program (Carla P. Wale, Northern Illinois Shapiro Law Library); a “New Website for State Online Legal Information” (Deborah Norwood, George Washington Jacob Burns Law Library); and Harvard’s Outreach Showcase Showdown held in March (Lisa Junghahn, Harvard Law Library). Yasmin continued “Law Librarian in the Dark” (a favorite of mine) in the Fall, Winter, and Spring/Summer issues with reviews of the TV series Battlestar Galactica, Exit Through the Gift Shop: A Bansky Film, and Ken Burns: The Central Park Five. The review of Exit Through the Gift Shop: A Bansky Film was written by guest columnist Alex Berrio Matamoros (C.U.N.Y. School of Law Library). I-Wei continued the “Survey Roundup” in the Spring/Summer issue. Thomas inaugurated the “Collaborative Law Librarian” column which appeared in Fall, Winter, and Spring/Summer issues. Margaret updated us on the work of the ALL-SIS Task Forces during the 2012-2013 academic year. Theo reviewed 2012 Annual Meeting (AM) programs about E-stats (A-4) and dealing with stress. Taryn reviewed “The New FDLP” program from the Annual Meeting, and contributed an article about the new FOIAOnline. Thomas reviewed an AM program about Law Library Research Assistant Programs. Yasmin reviewed AM program J-1 about Teaching though Questions and Controversy. Again this year, we had a good number of articles submitted by librarians who were not on the Newsletter Committee. I hope this trend continues in the future. Reviews of 2012 Annual Meeting programs were written by Ingrid Mattson, David Lehmann, Christine George, Jennifer Allison (2 reviews), Kelly Leong, Jennifer Mart-Rice, Steven Miller, and Kumar Jayasuria. Articles published in the Winter and Spring/Summer issues are highlighted above. Thank you to all the authors, whether members of the committee or not. Your work and scholarship is greatly appreciated by colleagues, I am sure. Finally, thanks go to Leah and the ALL-SIS Board for support and guidance during the 2012-2013 year. The 2012-2013 ALL-SIS Nominations Committee was comprised of three members. Ron Wheeler and Joan Stringfellow were Chair and Vice Chair respectively, and Ed Hart was our third Committee member. The Committee started its work in late November. Last year, the Committee had seven members, but on the advice of the ALL-SIS Chair, the Committee Chair reduced that number to three. The Chair made sure all three chosen members were willing to participate, and let the others know that they would not be needed this year. The first task confronting the committee was writing the call for nominations. Drawing from the previous year’s call for nominations, the Committee drafted a new one which included more detailed descriptions of the positions available this year (Vice Chair/Chair Elect and Member-at-large). After the call for nominations was sent to the ALL-SIS membership the next step was to choose the candidates for this year’s election. Criteria normally considered when selecting candidates include geographic diversity, previous work for ALL-SIS and AALL, length of ALL-SIS membership, and anything demonstrating the ability to responsibly serve as an officer. Additionally, this year, the Chair expressed a desire to provide opportunities for participation to newer members or members who have not had the chance to become more involved. People who have recently served as officers or in other leadership capacities were excluded in the interest of making sure such positions are accessible to others. With the changes in programing made by the AMPC, the Programs Committee was asked to be flexible with the new process. Where in the past, the committee offered priority ranking to programs submitted to the AMPC, it was asked to act in an advisory role. The committee promoted on the listserve the submission of programs and offered our services for review and editing. Additionally, we were asked to submit only one ALL-SIS sponsored program to the conference. For the up-coming year, the committee should be able to revise the committee handbook in light of the AMPC changes as there is now one year of the new system to use for guidance. The Research and Scholarship Committee is a new committee, created in July 2012. The Committee has been very productive this year thanks to the hard work and creativity of the committee members (Andrea Alexander, Michael Chiorazzi, Susan deMaine, Jordan (Gilberton) Jefferson, Benjamin Keele, Anne Klinefelter, Sarah Lamdan, Catherine Lemmer, Ellen Richardson, Taryn Rucinski, Carla Wale). The Committee has established the Scholarly Writing Mentor Program, which is a scholarly writing network and support program for law librarians. More details on this program appear in an article in the June 2013 ALL-SIS newsletter. The program is the work of the Scholarly Writing Mentor Program Sub-Committee (Carla Wale, Chair). The Committee will be promoting the Scholarly Writing Mentor Program at the AALL 2013 Annual Meeting. Law librarians interested in participating as a mentee or mentor are encouraged to email LawLibariansMentor@gmail.com. The Research and Scholarship Committee now has a wiki to provide information and resources for law librarians interested in scholarship. The wiki is available at http://lawlibrarianswrite.pbworks.com/. The creation and maintenance of the wiki is the work of the Web Presence Sub-Committee (Jordan (Gilberton) Jefferson, Chair). The Grant Program Sub-Committee (Ben Keele, Chair) drafted a proposal to establish a research and scholarship grant program. The proposal was sent to the ALL-SIS Board in May 2013 for review and advice on future development of the program. The ALL-SIS Student Services Committee had a productive year and its members worked diligently on four projects, described in detail below. Maureen Cahill, Patricia Dickerson, and Erin Schlicht coordinated with the ALL-SIS Task Force on Identifying Skills & Knowledge for Legal Practice to develop a great program for the annual meeting, “Meeting the Needs of Students and Their Future Employers: Discussions on Legal Research Instruction and Student Services Inspired by Practitioner Feedback.” This program will begin with a panel discussion of a recent survey of librarians and legal practitioners about research skills and training and access to and use of research resources. The panel will be followed by roundtable discussions of how the survey results inform considerations of the law school curriculum, advanced legal research courses, and other research instruction. The program will take place on Tuesday, July 16, 10:15am-11:45am. We hope to see you there! Frances Brillantine and Jennifer Prilliman updated the committee’s former “Bank of Sample Student Services Documents” and transformed it into a new collection, “Student Services Websites & User Guides.” This new resource, available on the committee’s website (http://www.aallnet.org/sis/allsis/committees/students/ documents.asp), will enable librarians to readily locate information on the various services offered to students at different law school libraries. Amy Ash, Rob Beharriell, Heather Casey, Stacy Etheredge, and Morgan Stoddard worked on creating a Student Services Toolkit. The Toolkit will contain a wealth of information, including information on services offered to students, job descriptions of student services positions, marketing to students, and a bibliography. Work on the Toolkit is in progress, and it will eventually be posted to the committee’s website. In March 2013, the committee hosted an online discussion on the ALL-SIS listserv about student services. The discussion covered several topics, such as orientation activities, outreach to student organizations, and mobile technology, and participants shared many excellent ideas. The discussion was coordinated by Rob Beharriell, Heather Casey, and Morgan Stoddard, and the questions and responses will be posted to the com mittee’s website. Committee Members: Morgan M. Stoddard, Chair (Georgetown University), Frances Brillantine, Vice Chair (Catholic University), Amy D. Ash (Thomas M. Cooley Law School), Rob Beharriell (Nova Southeastern University), Maureen Cahill (University of Georgia), Heather Casey (Georgetown University), Patricia Dickerson (North Carolina Central University), Stacy Etheredge (West Virginia University), Jennifer S. Prilliman (Oklahoma City University), Erin Schlicht (University of Minnesota). As of the time of this newsletter, the Scholarly Communication Task Force was finalizing the report required by it’s charge with review by members, other contributors, and other entities identified for potential partnering in activities. Major themes emanating of the recommendations are: law-specific education/training; consumer advocacy; facilitating existing projects by member motivation and collaboration; and serving as an information clearing-house and discussion facilitator for collaborative activities and information sharing. A web page was created for sharing information from the report, including appendices, tables, etc. http://scholarlycommunication.weebly.com At some point, this page could be adapted and/or migrated to the AALLNet server (and the ALL-SIS website) with certain sections even password-protected and to some other more easily editable and collaborative form such as a wiki. There is also a pre-populated Zotero group library https://www.zotero.org/groups/allsisscholcomm/items which includes references cited in the report as well as additional readings. Continue with website/clearinghouse for use by ALL-SIS members. It could be easily editable by all ALL-SIS members and AALL members more generally. Appoint standing committee or continuing task force to move forward with some of the recommendations of this report. This group could include chairs from existing committees and groups (e.g. faculty services, programs, continuing education, collection development, Bluebook, liaison to ABA and AALS). Explore professional development programming recommendations in conjunction with planning programs for next year’s annual meeting. The task force looks forward to review of the report by the Board, as well as feedback and action items on the recommendations. The ALL-SIS Task Force on the Use of Mobile Technology was charged to “draft a report to help academic law libraries evaluate mobile technologies and determine how to best use them to meet the needs of their patrons.” After a year of hard work, the Task Force completed its study and drafted a white paper entitled Evaluating Mobile Technology: The Formula for Success. The paper and five accompanying Excel spreadsheets were submitted to the ALL-SIS Executive Board on May 14th. What the other needs the of the library’s patrons are. Once a Master Technology Plan is adopted, librarians may use the knowledge within this white paper and its accompanying spreadsheets to evaluate and compare different mobile technology devices. Librarians can identify the criteria that are most important to them to make the comparisons and assign them specific weights. The devices are then ranked according to how well the device meets the stated trait or criteria. A formula is provided that calculates which device would be best for the library. All of this is done in spreadsheet format and is explained in the paper. Different spreadsheets have been prepared for tablets, e-readers, and smartphones, as well as one for generic technology. The paper’s appendices provide suggested technology resources, including online sources for locating information about technology, and the bibliography of articles used in putting the paper together. The white paper and spreadsheets (with working formulas) should be available for download soon from the ALL-SIS website. This paper would not have been completed without the hard work of the committee, and I would like to thank all of the committee members: Karina Condra, Whitney Curtis, Jez Gaddoura, Jamie M. Keller, Nichelle J. Perry, Carla Wale, and Michael Whiteman. As the ALL-SIS Webmaster for 2012-13, I worked with the Executive Board, Newsletter Editor, and various committees to update and maintain information across the ALL-SIS website. With the support of the Taskforce to Review & Update the ALL-SIS Web Presence, I have also worked to move the section’s web presence onto AALL’s primary web platform, AALLnet. During the summer and fall of 2012, AALL performed an automated migration of SIS websites into its Symplicity content management system (CMS) and provided training webinars for SIS webmasters. Since that time, I have been diligently cleaning up hundreds of pages of ALL-SIS web content, arranging them within the CMS’s unique file structure, and adjusting the graphics and layout to work with AALLnet display templates. This process is ongoing, but should be completed during the summer of 2013. When the migration is complete and the new site is launched, the section’s online content will be linked more closely to the AALL brand and should fit more comfortably within the AALLnet structure. Among other benefits, this will allow AALL members to access most ALL-SIS resources using their general membership login credentials, rather than the separate username and password employed over the past three years. This past year, the ALL-NEW/Membership ALL-SIS Subcommittee, planned and prepared for our annual roundtable at the 2012 conference in Boston. The event will be a “meet–and–greet/discussion” session where newer librarians will be able to speak with experienced academic law librarians. The committee selected the discussion topics and recruited discussion leaders or experts. The experts will host six concurrent discussion groups on topics such as career counseling, law library management, law technology, legal research instruction (two groups) and non-JDs in the academic law library. Each attendee has the option to join whichever discussion(s) he finds interesting. We have also created a brief survey to evaluate the event. The Chair would like to thank all of the members for their hard work this past year. On behalf of the ALL-SIS Awards Committee, it is my great pleasure to announce the following 2011-12 award and grant winners. Congratulations to all the winners who will be recognized at the ALL-SIS Reception and Awards Ceremony to be held on Sunday, July 22, 2012, 6:30 p.m. – 8:30 p.m. at the Sheraton-Republic Ballroom AB, during the AALL meeting in Boston. The winner of this year’s AALL Leadership Academy Grant is Jennifer L. Wondracek of Lawton Chiles Legal Information Center at the University of Florida. http://papers.ssrn.com/sol3/papers.cfm?abstract_id=1917005. Kathleen Darvil is Access Services-Reference Librarian and Adjunct Professor of Law at Brooklyn Law School and Aliza B. Kaplan is Associate Professor of Legal Analysis & Writing at Lewis & Clerk Law School. The Active Member Stimulus Grant winner is Sara Sampson, Deputy Director of the Law Library and Assistant Clinical Professor of Law at the University of North Carolina at Chapel Hill. The Regular Member Stimulus Grant is given to Michelle Cosby, Senior Reference and Instructional Services Librarian at North Carolina Central University School of Law. Jennifer Mart-Rice, Interim Assistant Director for Collection Development, Acquisition, and Serials at Chase College of Law Library at Northern Kentucky University. Although the Committee made a special effort to solicit nominations, unfortunately there were no nominations received for the Frederick Charles Hicks Award for Outstanding Contributions to Academic Law Librarianship or the Outstanding Service Award. The ALL-SIS Awards Committee was very active and busy this year. The AALL Leadership Academy Grant was added to the ALL-SIS awards and grants for the first time in the fall. The Committee acted quickly and worked very hard to prepare and process this award on time. There were also a few changes made to existing grants. The amount of grants was doubled, for the two stimulus grants and the two CONELL grants replaced the existing one. The criteria and procedures for awards and grants were revised several times due to additions, changes, and improvements. The Committee was an energetic and enthusiastic group this year. I would like to thank each of the committee members for their excellent work. This year’s Awards Committee members were: Masako Patrum, Chair (Florida International University College of Law Library); Irene Crisci (Touro College Jacob D. Fuchsburg Law Center); Lisa A. Goodman (Texas Wesleyan University School of Law Library); Jane Larrington (University of San Diego Legal Research Center); Matthew M. Morrison (Cornell University Law Library); and Nancy L. Strohmeyer (Barry University School of Law Library). Additional information on ALL-SIS awards and grants can be found at the ALL-SIS Awards Committee website at https://www.aallnet.org/allsis/awards-grants/. This year’s committee members are: Sue Altmeyer, Dragomir Cosanici, Beth DiFelice, Shaun Esposito, Joseph Gerken, Susanna Leers, Kris Niedringhaus (Chair), and Tawnya Plumb. The committee has a strong commitment to the high quality of CALI’s legal research lessons and maintaining a strong relationship with CALI. Since August 2011, the Legal Research Community Authoring Project Advisory Panel (LRCAP), made up of the ALL-SIS CALI committee members, reviewed approximately 15 new lesson proposals. Since August 2011, we’ve added thirteen legal research lessons to the CALI Library. We have 37 lessons currently in progress. During 2011-12, 5 lessons were reviewed, and revised as necessary, by either the CALI Author or a CALI Reviser. Another 5 lessons are in the process of being reviewed and revised. For several years the committee has been working to get lessons on legal research using primary and secondary sources for all 50 states. We now have 42 states that have at least one state specific legal research lesson. CALI is beginning to focus increased attention on the eLangdell Press and eLangdell Commons projects. Both are designed to provide support for open-access legal publishing. CALI would like to see a legal research text written as part of the eLangdell Press. In addition, there will be a push to populate eLangdell Commons with Legal Research and Advanced Legal Research syllabi and course materials. I believe these are both good efforts for the committee to collaborate with CALI on in the upcoming year. I also believe that this might potentially be a nice point of collaboration between the ALL-SIS Sourcebook for Teaching Legal Research committee, the ALL-SIS CALI committee and the CALI eLangdell Commons. CALI has continued its Reviser Project which was launched with the help of the committee at the CONELL Marketplace and AALL in July 2010. This project allows a law librarian to adopt an “orphaned” CALI lesson. Lessons may be orphaned because the original author has retired or no longer has the time to review, edit and update the lesson. This is a nice way to learn the CALI Author software and earns the Reviser a shared authoring credit (listed in OCLC). We’ve had an excellent response to the Reviser Project and have found it to be a useful vehicle for involving newer librarians. The ALL-SIS CALI Committee will staff a table at the CONELL Marketplace for a third time in Boston. This past year, the ALL-SIS Collection Development Committee had active discussions, which have been interesting and will likely lead to good program plans for the Annual Meeting in 2013. At the 2011 Annual Meeting in Philadelphia, the Collection Development Committee hosted a roundtable titled: E-Books, E-Resources, E-Readers, E-Nevitable: Has the Time Come to Officially Prefer Electronic Over Print Resources in Our Collection Development Policies?. The topic led to a thought-provoking discussion about how our collection policies may better reflect changes in format preferences and in licensing and access issues across vendors. Some libraries are experimenting with patron-driven access, others are incorporating eReaders, and many are shedding state print materials. There is still a lot of variation among how quickly different libraries are embracing digital content. One thing is certain – students often prefer it – alumni often don’t get access – and not a small number of faculty maintain a preference for print. How do different libraries use social media tools to promote collections; and what has been user response? What are different libraries doing to experiment with or fully incorporate the use of eReaders (per Svetlana’s question below)? How do or could collection policies address issues of web archiving? What are best practices for collecting foreign materials – maybe organized by geographic scope? The Committee made a few updates to the collection development contacts and policies webpage. Special thanks to the speedy assistance of Creighton Miller, the ALL-SIS Web Administrator, all of the Committee’s webpages have now been updated. The Committee is looking forward to the Annual Meeting in Boston. The Committee meeting will be held on Sunday (7/22) from 5:45 pm to 6:45 pm in the Sheraton-Jefferson. Committee members – and anyone looking to become a member – are encouraged to join for a discussion on future programs and projects. The Committee will host a Collection Development Roundtable on Monday (7/23) from 5:45 pm to 7:00 pm in HCC-Room 300 on the topic: Managing ejournal subscriptions in a fragmented collecting and licensing world. Everyone is invited to come share their experiences. The discussion can be both broad and specific. Discussion questions may include: unbundled print and online subscriptions, managing IP authentication, workflow successes and licensing language. It’s been a great year. The Committee looks forward to building on our discussions for more activity in 2013. And, we are grateful to all that has been done so far – big thanks especially to Paul Moorman for his contributions and Committee Chair. Because Erica Wayne was appointed to chair the committee for the Middle Managers’ Breakfast, and worked with you on the Business Breakfast, and BNA’s Mike Bernier is really overseeing the ALL-SIS Reception, there was really only the Directors’ Breakfast for the Local Arrangements Committee to take care of. The Directors’ Breakfast has a menu chosen after a quick survey on the LawLibDir listserve. We could not, of course, please everyone, but we probably have hit the middle course. I think people at least liked being asked. I chose a speaker I know is interesting and entertaining when speaking about a cutting-edge area of the law. Professor Charles Kindregan specializes in Assisted Reproductive Technology and the Law. The intersection of medical technology and family law produces amazing anecdotes and heart-wrenching dilemmas. I am attaching the flier I produced for Public Relations, which includes the details of the menu and Prof. Kindregan’s selected C.V. This year, the focus of the faculty services committee has been to get the Faculty Services Toolkit online, publicize its presence on the ALL-SIS webpage, and encourage other librarians to contribute content to the Toolkit. We have also worked on a few specialized items, as well as have planned our annual meeting roundtable. Thanks to the hard work of last year’s faculty services committee, this year’s committee had a good draft of the toolkit. Thus, we began the year by looking over the toolkit and making sure it was free of mistakes before submitting it for posting on the website. We additionally considered if other topics should be added to the toolkit. In the fall, we began discussing ways that we might promote the Toolkit among the ALL-SIS membership, and we decided to have a weeklong “rollout” where we would host online discussions highlighting parts of the toolkit. We held this event in late January. Various committee members participated by leading the discussion with topics representing particular sections of the toolkit. Unfortunately, the technical difficulties of working with the AALL Communities posting limited participation by others in the online discussions. This was frustrating for committee members who devoted significant time to planning useful discussion topics, as well as for other members of ALL-SIS leadership, who also experienced difficulty with communication through the AALL Communities system. In spite of these difficulties, the committee still identified ways in which the toolkit can be expanded in the future to include materials from more libraries with faculty services programs. Aside from working to promote the toolkit, the committee also reviewed and gave suggestions for the ALL-SIS board’s desire to create a Scholarly Communications Task Force. We supplied the Board with four recommendations, as committee member Stephanie Davidson indicated she would like to serve on the Scholarly Communications Task Force as a a liaison to the Faculty Services Committee. Finally, the committee has also been involved in planning a roundtable session for the AALL Annual Meeting in Boston. We are planning topics and dividing tasks among committee members to lead discussions for the roundtable sessions. The past roundtable sessions like last years have been well attended and we hope to continue this at this year’s meeting. Last year’s notes from the roundtables have been posted on the ALL-SIS website. The Legal Research & Sourcebook Committee consists of three subcommittees with unique focuses. The report recounts the substantial accomplishments of these subcommittees during 2011-2012. Sourcebook, table tents were prepared for display at AALL’s 2012 annual meeting in Boston. Last year some questions were raised about the language in the ALL-SIS non-exclusive license agreement. In response, the Sourcebook subcommittee reviewed the current agreement as well as the RIPS-SIS copyright release, various general release forms, descriptions of creative commons licenses, a model contract from the Open Access Law Program, and the AALS Model Author/Journal Agreement. After doing so and with the intention of addressing the licensee concerns and maintaining a wide pool of potential contributors, the subcommittee recommended some modifications to the ALL-SIS agreement. Finally, the subcommittee was asked to consider who should have access to the Sourcebook; members recommended that the Sourcebook be opened to all AALL members. Another subcommittee focused on the Legal Research Roundtable for the 2012 AALL annual meeting. During the spring, the Roundtable subcommittee generated and finalized a list of discussion topics. Many of the topics related to librarians’ role in helping law students develop research skills for professional practice, librarian support for law school skills programs, and programs for specific student populations. The subcommittee also selected several topics that contemplate the challenging legal environment facing law students and recent graduates. Subcommittee members volunteered to facilitate the discussions, as well as to recruit others to serve as facilitators and note-takers. Subcommittee members also generated a range of ideas to promote the Roundtable both within the ALL-SIS community and among colleagues who work in other types of organizations. These efforts were carried out in the weeks preceding the annual meeting. In 2010, a group of four volunteers formed a subcommittee of the ALL-SIS Legal Research and Sourcebook Committee. They were charged with developing and administering a survey that would collect data about law librarians teaching legal research at law schools. With the approval of the 2010-2011 ALL-SIS Executive Board, the survey, consisting of 33 questions, was distributed to 240 law school in the United States. The questions were divided into four parts: 1) general overview; 2) first-year legal research; 3) advanced legal research; and 4) other legal research class offerings. Law Schools were asked to submit one response per each law school. The subcommittee received 137 responses. After eliminating duplicate and incomplete responses, the subcommittee members began analyzing the data. During 2011-2012, the subcommittee examined the collected data and began writing a report. The 36-page report graphically presents results and quantifies open-ended responses, where appropriate, and consists of an introduction, methodology, analysis, conclusion, and recommendation sections. The subcommittee members intend for the report to represent a current snapshot of law librarians teaching legal research in the U.S. law schools. To present their data to as large of an audience as possible, the subcommittee submitted a poster session proposal for the 2012 AALL meeting, which was accepted. The poster titled, Law Librarians as Educators: A Survey of Our Involvement in Teaching, was on display throughout the annual meeting at the Exhibit Hall, and subcommittee members were available at a question-and-answer period to answer questions and discuss their work. This poster illustrated the process used in identifying the information, creating the survey questions, producing and sending out the survey, and compiling the results. In addition, the poster outlined some of the main conclusions drawn from the obtained data. Eventually, the subcommittee members who worked on the survey hope to publish the report in its entirety. Their intention with the survey was to create a solid base of information about librarians teaching legal research that would also provide a source of ideas and inspiration to law librarians across the country. The 2011 – 2012 Newsletter Committee consisted of Barbara Gellis Traub, Chair, Rittenberg Law Library, St. John‘s University School of Law; Sue Kelleher, Texas Tech University School of Law Library; Yasmin Sokkar Harker, CUNY Law School Library; Steven Robert Miller, Indiana University School of Law – Indianapolis; I-Wei Wang, UC Berkeley School of Law Library; Jacquelyn McCloud, University of Iowa Law Library; Susan Boland, Robert S. Marx Law Library, University of Cincinnati College of Law; and Michele Thomas, University of Arkansas at Little Rock Law Library. Our Board Liaison was Leah Sandwell-Weiss. Our three regular issues this year were published on December 13, 2011, March 9, 2012, and approximately June 21, 2012; the election issue was published on March 26, 2011. In addition to our regular columns, the Winter issue published 4 articles submitted by non-Committee members. These articles covered “Advising Faculty on Law Journal Publication Agreements” (Benjamin Keele, William & Mary); “A Lesson in Leadership” (Jennifer Wondracek, Fredric Levin College of Law); a comparison of four citators (Pamela Brannon, Georgia State); and a report on a faculty/student/alumni symposium at St. John’s University DLIS (Taryn Rucinski, Pace). Articles on ALL-SIS and other programs, awards, and activities scheduled at the upcoming annual meeting, several committee annual reports, and a report of the teaching showcase held at Harvard Law School during the winter. (Spring/Summer 2012). Yasmin continued “Law Librarian in the Dark” (a favorite of mine) in the Fall and Winter issues with reviews of A Passage to India and Conviction. For the latter Yasmin arranged a guest columnist, Sarah Shik Lamdan from CUNY School of Law. I-Wei continued the “Survey Roundup” in the Winter issue. In the Fall issue, Steve Miller reviewed “Legal Research Skills in the Classroom & Firm” program at the 2011 Annual Meeting. Two other reviews of 2011 AM programs were submitted by Jacquelyn McCloud (“Best Practices for Evaluating a New Electronic Resource” and “E-Books and the Future of Legal Publishing”). Susan Boland reviewed “Cutting Beyond the Bone: Managing in an Age of Austerity”. This year, I am pleased to report we had a good number of articles submitted by librarians who were not on the Newsletter Committee. I hope this trend continues in the future. Reviews of 2011 Annual Meeting programs were written by Karin Johnsrud (2 articles), Judy K. Davis (2 articles), Margaret Schilt, David Lehman, and Lauren Schroeder. Articles published in the Winter issue are highlighted above. Last, but certainly not least, the final issue of the year included an article by Lisa Junghahn reporting on the Teaching Showcase held at Harvard Law School. Newsletter ‘housekeeping’ included updating the Ulrich’s entry for the ALL-SIS Newsletter, and applying for an ISSN for it. Thank you to all the authors, whether members of the committee or not. Your work and scholarship is greatly appreciated by colleagues, I am sure. Finally, thanks go to Kumar and the ALL-SIS Board for support and guidance during the 2011-2012 year. The 2011-2012 ALL-SIS Nominations Committee was comprised of seven members this year. Michele Finerty, Ruth Levor, Joan Stringfellow, Ryan Overdorf, and Lisa Spar were members. Kurt Meyer and Ron Wheeler were Chair and Vice Chair respectively. The Committee started its work in late November. The Chair made sure all the members were willing to participate. The first task confronting the committee was writing the call for nominations. Drawing from the previous year’s call for nominations, the Committee drafted a new one which included more detailed descriptions of the positions available this year (Vice Chair/Chair Elect and Secretary/Treasurer). After the call for nominations was sent to the ALL-SIS membership the next step was to pick candidates for this year’s election. Criteria normally considered when selecting candidates include geographic diversity, previous work for ALL-SIS and AALL, how long the person has been an ALL-SIS member, and anything demonstrating the ability to responsibly serve as an officer. People who have recently served as officers are sometimes excluded in the interest of making sure such positions are accessible to others. The Committee received four nominations for each position. This year was unique to say the least. The collection of nominees was as geographically diverse as possible with no adjustments from the Committee. All nominees were highly qualified and none of them had recently served as ALL-SIS officers. At the same time all the nominees had demonstrated a commitment to serving AALL and ALL-SIS. As a result, weeding nominees was difficult. The Committee unanimously decided to forward all the names to the Secretary/Treasurer for the election. We reviewed the ALL-SIS Bylaws to make sure this was allowed and consulted the candidates. One dropped out so we ended up sending seven names. While sending several names is allowed under the rules, we learned from the Secretary/Treasurer that it does pose problems for the election process. In the future it would be preferable to send fewer names in the interest of ensuring someone wins by a majority or, at the least, a clear plurality. Nonetheless, the nominations process went very well and we were fortunate to have a uniformly well-qualified list of nominees. As Chair I would like to take this opportunity to thank the other six members of the Committee for their hard work and, above all else, responsiveness. Your willingness to provide timely input made my job very easy. The nominations process was a success thanks to you and I’m proud to say we made some valuable improvements to it. I-4: Pruning the Collection, Growing Services: What‘s New in YOUR Library? The Programs Committee then worked with the ALL-SIS Newsletter, Webmaster, and Public Relations Committee to publicize these programs. The Programs Committee also coordinated the recording of the independently sponsored programs. Also during the year, the Programs Committee had a few additional projects. The Committee made an initial draft response to the Velvet Chainsaw Consulting Report regarding the Annual Meeting. The ALL-SIS Board revised the response and provided a response to the Association. The Programs Committee also began work on membership surveys to better guide the 2012-2013 Programs Committee regarding the program interests of the ALL-SIS membership. Finally, the committee handbook is in revision, particularly to expand the information regarding the selection and other issues related to ALL-SIS sponsored programs. The 2012-2013 Annual Meeting Program Com-mittee has been in contact with the Programs Com-mittee leadership, indicating that there will be changes to the program solicitation and selection process for the 2013 meeting in Seattle. As more information becomes available, the Programs Com-mittee will share it with ALL-SIS membership. The expert analysis suggested by this first recommendation seems already to exist, and therefore it may be unnecessary for ALL-SIS to do more than update the available conclusions. In light of Seto’s work, the problem seems not to be how the library data are reported, but the size of the impact library data will have, whatever form it takes. If ALL-SIS intends to lobby US News for significant changes, the first preference should perhaps be to increase the importance of the library for determining the school’s rank. Otherwise it makes little sense for ALL-SIS to expend much effort worrying about what data are used to calculate a factor that is, in most cases, insignificant to the school’s final rank. The second TF recommendation proposes that ALL-SIS search for alternative ways to report library data, beyond volume count. We agree with the TF that volume count is an uninformative statistic in this context, because, as Seto concludes, it reflects the past commitment of the school to the library, and not the current commitment which should be more relevant to assigning rank. The suggestion in the cover letter that this alternative might be found in budget data may be a step in the right direction, but only, in our opinion, were it normed in some way. Rich private schools will always spend more than small public ones, so in that sense the raw numbers would merely reflect that initial reality. Library Expenditures per student+faculty was one suggested alternative, keeping within the context specified by the TF that the data used be from the limited information within the ABA questionnaire. Another possibility is to express expenditures as a function of the student/faculty ratio, a figure US News already includes. We believe that such figures would be more meaningful than either the current volume counts, or a raw expenditures amount. We did not discuss whether better results would be obtained by using different variations of expenditure reports (e.g., materials, materials + supplies and other infrastructural outlays, or whether this should include salaries). the current and future research skills that law school graduates need to succeed in legal practice, the Task Force decided to create a survey to send out to practitioners and law librarians to assess the research skills of junior associates. The Task Force initially approached the Statistics Committee in September of 2011, asking the Committee to evaluate the survey questions to identify any potential problems. The Statistics Committee was able to view a draft of the survey by early December.The Task Force also gave the Statistics Committee a list of law schools to whose alumni they would send the survey. The Task Force asked for the Statistics Committee’s opinion on whether the geographic research was sufficient to make the results representative of the country as a whole.Upon review of the material, the Statistics Committee felt that the plans with respect to geographic distribution of the survey were appropriate given the Task Force’s objectives. The most populated legal markets would be covered as well as an assortment of smaller legal markets. The Statistics Committee also commented on the wording of questions, explaining how some questions might be unclear and how the responses to some questions might lead to different conclusions than the Task Force originally thought they might.Statistics Committee comments were delivered to the Task Force on December 8, 2011. The ALL-SIS Executive Board also requested that the Statistics Committee evaluate Qualtrics for a possible ALL-SIS subscription. The following information was conveyed to the Board on February 9:According to information collection by committee member Uwe Beltz, (1) ALL-SIS could subscribe; (2) it is unclear thus far whether the basic ($5K) subscription would allow multiple users, or whether, if the intention is to allow several ALL-SIS members to work projects, it would be necessary to have a $10K subscription. Pricing is approximate.The product itself earns nothing but raves; the real question would be whether this “Cadillac” service would be utilized sufficiently to warrant the annual cost. It may not be prudent to subscribe to the service in anticipation of its adequate use; it is very possible that even if news of the availability prodded intentions to use, that use, given the project design timelines, would not actually apply the product until late in the subscription. In other words, to subscribe at all may entail a minimum of two years commitment. Alternatively, rather than leading, ALL-SIS could be the follower here, letting a need be established before committing to a financially significant subscription. In addition to these projects, a subcommittee of Donovan and Black-Dorward continued to explore ways to increase its familiarity with existing data tools through compiling statistics on questions of relevance to law library professionals. The outcome is attached as an appendix. The 2010-2011 Statistics Committee Annual Report, Proposal to the ALL-SIS Executive Board Concerning Long-Term Direction for the Statistics Committee, proposed the exploration of an annual statistical report that would aim to generate new tools for the practice of law librarianship, and through participation in these projects cultivate a deeper pool of statistical literacy within the profession. One or more projects of this kind – conceived as an annual statistical report on the profession – in addition to whatever additional short-term assignments it may receive, would require the Committee to identify existing data sources, establish working relationships with external agencies that collect and report such data, mine the data to gather those informing the specific interests of ALL-SIS, and identify relevant gaps in those existing sources and identify reasonable means to fill that void. These are all needed skills that experience has shown must be cultivated within the Committee itself if it is to function adequately. The two discussions below demonstrate the kind of project envisioned (additional examples may be found in the Proposal). Each addresses a topic thought to be of relevance to current discussions within ALL-SIS by bringing to bear whatever statistical data could be identified. In addition to providing an overview of the question, the exploratory study concludes with some observations on the availability and usefulness of relevant information. The intention is that, should this be deemed a useful direction, the Executive Board will provide feedback and direction to the new Statistics Committee, and encourage its members to continue to refine the methodology and design of the project. Topic 1: How Racially Diverse is AALL? AALL is rightly concerned with the racial diversity of its membership, and has charged a standing committee specifically to address this issue. Unclear, however, is the actual representation of racial minorities with the organization either currently or a function of change over time, and how that representation compares with suitable benchmarks. For example, is AALL more or less racially diverse than the population at large, the legal profession, librarianship, or law school enrollments generally? If there is a perceived shortfall among AALL memberships in absolute terms, comparative rates could help inform where the failure to attract minority law librarians occurs in the professional development pipeline, and allow us to more effectively target remedial solutions. For ease of interpretation, the figures can be represented in the following bar graph. The immediate lesson appears to be that AALL is less racially diverse than similar professional groups, or of the general population. The number reported here can be compared with discussion from other sources: “In our 1992 study, we cited sources showing that the percentage of minorities in law libraries (8.9%) was lower than the percentage of minorities in libraries in general (12.3%). 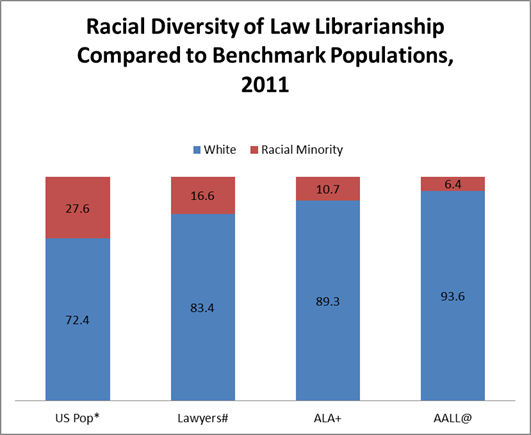 The situation has changed, however, and now the percentage of minorities in both populations is approximately 12%.” Rhea Ballard-Thrower, Dwight King, and Grace M. Mills, Profiling Minority Law Librarians: An Update, 101 Law Library Journal 267, 270 (2009). Such results reporting higher racial diversity within AALL are perhaps explainable by the differing methodologies used to obtain the data. Ballard-Thrower et al. report on a variety of survey instruments, including the AALL Salary Survey, while the information here used attempts to reflect the entirety of AALL membership rather than a self-selected survey sample. A different question concerns not simply the bald fact of whether or not AALL is sufficiently racially diverse (it apparently is not), but whether it is improving in this regard. To evaluate that problem, we collect both the raw AALL membership number, as well as the number of minority law librarians. Directory and Handbook, as well as in the Year in Brief. This information no longer appears in either of these publications, and must now be obtained directly from AALL by special request. The good news is that for every year in the studied range (2001-2009), racial minorities increased their proportional presence in AALL. Over the decade, that rate has almost doubled. Whether this outcome is the inevitable outcome of increased career opportunities for a historically disadvantaged population, or the direct result of remedial efforts by AALL, we cannot ascertain with certainty. The steady increase over the decade, however, suggests the former. These analyses depend heavily upon the quality and availability of information from AALL. It would make sense for the association to renew its previous openness about basic membership statistics, to encourage more study. Although the total membership numbers reflect the full universe of AALL members, the data on minority law librarians is presumably drawn from the individually provided demographic data in the Confidential Profile in the online members’ directory. The quality of these data, and many others, could be improved if AALL were able to find additional incentives to encourage members to complete these optional sections of the directory. Alternatively, we note that the ABA questionnaire does collect race and ethnicity information on library staff. This would presumably be the most complete and accurate data on this topic, with the information from AALL being an indirect proxy measure. Unfortunately the ABA is quite stingy with its collected information. Attempts to open discussion about just what ABA is willing to do (e.g., to get aggregated numbers on this variable would require running a special report which it is not clear ABA is willing to perform, nor at what cost). More influential representatives of ALL-SIS should press this matter further. Study 1: What percentage of law librarians teach? Academic law librarians appear to be increasingly involved in the teaching of legal research at law schools. The implications of librarian teaching are of interest to the profession in several ways. First, time spent teaching (including curriculum preparation and marking of assignments) is time away from the traditional librarian duties of providing reference, collection development etc. Are there staffing issues associated with increased teaching? Second, is the librarian as teacher becoming the norm in the profession? Is this something that libraries are offering so that they can maintain their relevance? Finally, how do law librarians feel about increased teaching? Are they excited about the challenge or are they put off by the challenges of class preparation, grading and public speaking? Are those librarians who are not interested in teaching able to say “no” or is teaching becoming a job requirement for law librarians? Most of the issues articulated above can only be explored through in-depth surveys. In the meantime, it might be interesting to discover whether there has been an increase in librarian teaching. The AALL Biennial Salary Survey has information, in the academic section, on the teaching status of librarians. Upon review of the surveys from 1997-2011, there was some variation in survey technique. Therefore the results of the 2003, 2005, 2007, 2009 and 2011 surveys only have been included here, as these surveys were consistent over time. The AALL survey data is broken down by professional v. non-professional librarians. As the number of teaching non-professional librarians was always zero, the table below only contains numbers for professional librarians. 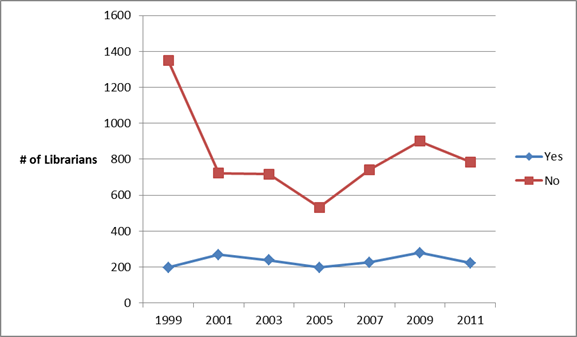 The above table shows a general increase in teaching by law librarians. One of the weaknesses of the AALL Salary Survey data is the inability to analyze the answers to the teaching question in relation to certain subsets of the librarian population. The AALL numbers above relate to professional librarians, as opposed to non-professional. However, “professional librarian” may include technical services librarians, circulation librarians etc. Anecdotal evidence suggests that most academic law librarians who teach are reference librarians. There are also suggestions that most librarians who teach hold law degrees. It would be interesting to be able to look at the answers to the teaching question with respect to those subsets of librarians. It may be that we would see greater increases in teaching librarians within those subsets. Underscoring the previous comments, this is another area in which access to the ABA data would be insightful, as it would allow examination of the entire universe of academic law libraries rather than a self-selected sample. Do a survey to determine teaching involvement amongst subsets of librarian populations including law degree holders, reference librarians, technical services librarians etc. Do a survey to evaluate how much time is devoted to teaching, as compared with other library work. This could provide some insight into staffing issues. Evaluate whether teaching is becoming the standard amongst academic law librarians. This could be done either by means of a survey or by other ways such as examining job postings to see if teaching is mentioned under job duties. Do a survey to see how law librarians feel about teaching. Study 2: What percentage of academic law librarians hold tenure-track positions? Tenure helps ensure freedom of expression and allows librarians to share in the collective responsibility for their institution. There is great variation amongst academic law libraries as to whether librarian positions are tenure-track or not. The number of librarians that are tenure-track may be of interest to the profession for a number of reasons. First, it may be that tenure-track positions are a recruitment or retention tool. There may also be the perception of increased status associated with tenure or tenure-track positions. Alternatively, some librarians may view tenure-track positions negatively, as an increase in work load without commensurate benefit. Most of the issues above require more in depth exploration but general knowledge of the number of librarians holding tenure-track positions may start the conversation. The AALL Biennial Salary Survey includes information on the number of respondents who reported holding tenure-track positions. The survey is divided into two main groups of professional vs. non-professional librarians. As there were only two years reporting a total of 6 instances where non-professional librarians held tenure-track positions, the table below contains the numbers for professional librarians only. If one looked solely at the percentages in Table 1, this would suggest a big increase in the number of librarians with tenure-track positions. However, as we can see from Graph 1 and the numeric totals of librarians, it appears to be the case that there was a drastic reduction in the number of respondents that were non-tenure-track, as opposed to a significant increase in the number of tenure-track librarians. Unfortunately, from the information we have, we cannot know whether this was due a reduction in the number of non-tenure-track librarians in the profession or a reduction in participation in the survey. What the data seem to show is that the number of tenure-track positions amongst professional academic law librarians has remained fairly flat, especially when compared with non-tenure track positions. It appears that somewhere between 22-27% of all professional librarian positions are tenure-track. An evaluation of academic law librarian job postings which typically mention whether a position is tenure-track. This might be useful to obtain other data such as whether tenure-track positions typically require law degrees and whether they require teaching as part of the job description. A survey of academic law librarians to find out their views on tenure-track positions. Are these positions viewed as more prestigious or do some librarians avoid them for reasons such as perceived additional work load? One other interesting survey would be to see if tenure-track librarians stay in their positions for longer or if they leave at the same rate as other librarians. The Committee was charged with reviewing and rewriting the ALL-SIS Strategic Plan. We were originally given a very short time span in which to accomplish this task. Since the SIS has been operating without a Strategic Plan since July 2010, we were granted permission to take longer and to do a thorough review and re-write. The completion date was extended to early spring 2013. Plans were executed to get input from the committees and SIS members. This work was begun this year and will be completed and incorporated into the new draft which will go to the ALL-SIS Board in 2012-13. Participated in the 2012 AALL Annual Meeting’s Poster Session. We submitted a proposal, “Starting a Student Library Advisory Board,” which was accepted. The poster will be presented and displayed in the exhibit hall during the Annual Meeting in Boston. Each table will have a moderator and note taker and a report will be compiled and available on the ALL-SIS Student Services committee’s website by September 2012. There is an alternative plan in case attendance is light. The ALL-SIS Student Services committee meeting is scheduled for 12:00 p.m., on Sunday, July 22, 2012. We will discuss our poster session, the student services roundtable, and discuss plans for the upcoming year.